Make their day with our Brunch Tote Basket. 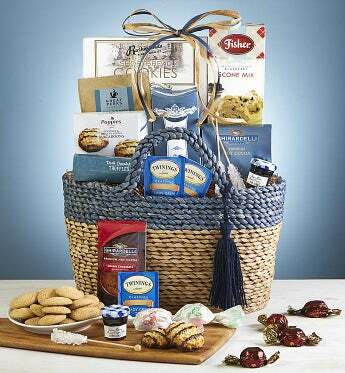 It has everything needed to prepare a delicious brunch including Fisher's® Blueberry Scone Mix, Ghirardellii® Double Chocolate Cocoa, Harry & David® Dark Chocolate Truffles, Bonne Maman® Grape Preserves, Twinings® Tea, Eurostyle Biscuits and more! They will love the stylish, straw tote with a raffia ribbon too!